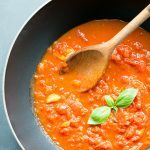 This classic Italian tomato sauce is one of those basic recipes you need to have in your life. It's conveniently vegetarian, dairy-free, vegan and gluten-free, and a great base for so many Italian dishes! Cut each whole canned tomato in half, remove seeds and juice, roughly chop into chunks, and set aside. Set aside any remaining sauce in the cans. Heat a medium sauce pan with 2 tbsp of extra-virgin olive oil and the garlic over medium low heat. Add in the onion, and gently stir-fry it together with the garlic for about 5 minutes. Cook until the onion is translucent and the garlic golden, then add in the tomatoes. Depending on your taste, discard the clove at this stage or when the sauce is cooked. Add in a couple of basil leaves, season with salt, pepper and a pinch of sugar (or add a bay leave), and gently stir-fry for a further 5 mins. Pour in the reserved juices from the cans, add in 1/3 cup (80 ml) of water, and cover the pan with a lid. Cook over low heat for about 15 minutes, stirring occasionally. Season with salt and pepper half-way through cooking time. The sauce is ready when it reaches a nice creamy but still chunky texture, and has just the right balance of sweetness and savoury when you taste it. Remove the sauce from the heat, and add in the remaining fresh basil leaves and serve with freshly cooked pasta.